Andrew Mitchell is desperate to deliver for Dungannon before his summertime departure. With his pre-contract agreement at Glenavon signed, sealed and delivered, the 22 year-old is keen to assure his current club that his eye won’t be tempted off the ball. Far from it - his determination to make it a landmark season at Stangmore is greater than ever. “I love playing for Dungannon Swifts and I will continue to do so until the end of the season,” he said. “I will be leaving the club with a heavy heart. It’s a great club with great people and I will be doing my utmost to ensure they finish as high up the table as possible. Mitchell is the Danske Bank Premiership’s top scorer with 19 league goals to his name so far this term. 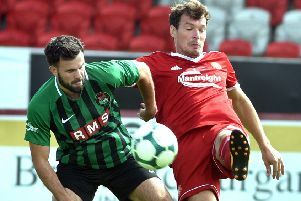 Understandably then, with his Dungannon contract ticking towards its end date this summer, Mitchell’s next stop was a hot topic around the league. And, in a strange twist of fate, this weekend he will come face to face with the club whose advances he turned down just days ago in favour of his boyhood Glenavon as Linfield arrive at Stangmore Park. Dungannon certainly can’t boast a good record against the Blues. They’ve won just one of the last 19 league meetings, with Linfield victorious in all of their last four visits to Stangmore Park. Nonetheless, Linfield boss David Healy is wary of the threat posed by Mitchell and his Swifts team-mates. “Andrew has had a good season so far but he hasn’t scored against us so far this season so hopefully that remains the same after Saturday,” he said. Mitchell has netted nine goals in nine appearances since Linfield’s 4-0 hammering at Stangmore but Healy’s side have an on-form forward of their own in captain Andy Waterworth. Linfield are still seven points adrift of league leaders Crusaders but Dungannon too, are facing a chase as they hunt down Glenavon in their bid to make the top six.